This September we are celebrating 15 years of our continued efforts on promoting awareness, providing support, educational resources and advancing research by hosting an anniversary fundraising event. All proceeds will go to continued awareness and research study to help aid in finding better treatment options. Throughout the years we have helped countless families share their stories, provided outstanding support, and other resources for those in need. We are asking for your sponsorship to bring this event to life and to help us improve diagnosis, treatment, and quality of life for those affected by LBD. The Lewy Body Dementia Association is a nonprofit organization that focuses our efforts on increasing awareness of Lewy body dementias. LBD is commonly misdiagnosed, most often as Alzheimer’s disease or a psychiatric disorder. As the only national organization focused solely on LBD, we are committed to advancing research in order to drive early diagnosis and find safe and effective treatments. Newly launched in 2017, LBDA’s Research Centers of Excellence program aims to improve LBD clinical care and establish a clinical trial-ready network. 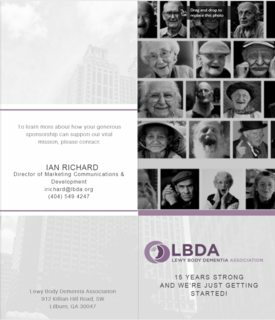 LBDA’s mission is also committed to providing support, outreach, and education to those affected by this neurodegenerative disease. The organization’s initiatives extend to those within the medical community. LBDA strives to develop educational resources and programs for healthcare professionals to reduce the risk of misdiagnosis and empower providers to create an effective treatment plan for persons diagnosed with LBD. Our goal is to make sure families from across the nation has support services and resources from anywhere. Through our caregiver link or certified support groups, members in need can reach anyone anywhere at any time with our diligent efforts to make support accessible. LBDA staff and Volunteers listen compassionately and confidently while offering advice and helpful resources to families needing guidance. With the help of 24 preeminent academic medical research centers, we are improving the quality of clinical support to the advances in diagnosis and treatment for those with LBD. For more information on the Research Centers of Excellence click here.